It's nearly Christmas and I have been looking at stocking fillers for different people and I have come up with some for the ladies in your life. Bill's have some perfect gift hampers and treats which are ideal for the lady who loves fine things. My box contained a bar of Bill's dark chocolate, bramble berry infusion and some gorgeous red velvet cupcake truffles, they all came in the most perfect keepsake box. Prices start at £30 for a hamper but things can be bought individually on their website Bill's. 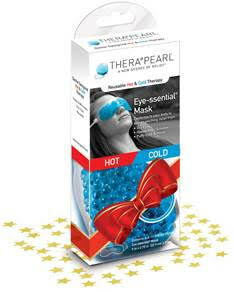 The Thera Pearl Eye-Essential Mask is a new product to hit the streets, it can be used hot or cold. When hot it can provide stress relief and relieve symptoms of dry eye or computer strain along with certain eye conditions such as blepharitis and styes and used cold it can help reduce puffy eyes and headaches. I think this is a great idea, especially for anyone who spends alot of time on the computer, 20 minutes at the end of the day or when needed and it provides great benefits. The mask costs £7.99 and can be bought from Superdrug. With relaxation in mind Roxy Shahidi who appears in Emmerdale has released a new Yoga DVD called AM/PM Yoga for Beginners. I have always fancied something alot less strenuous on my joints and this is fab. With AM sessions created to awaken and energise the body and PM sessions to help you relax and unwind, wouldn't this make an ideal gift. The DVD costs £12.99 and is available on Amazon. Dr Bronners has produced an Orange and Ginger lip and body balm, a perfect little treat to pop in your handbag to moisten those lips, hands and elbows. You can buy these items nationwide and also on the Dr Bronners website. The lip balm is £2.69 and the body balm costs 3.99. Nelsons Natural Health and Beauty have some fabulous natural healthcare products available. The Arnicare bath and massage balm is enriched with evening primrose and almond oil and can be used for massage or in a nice hot bath to help tired muscles, priced £8.15. Calendula cream is perfect for overworked hands, priced £5.09. Arnicare cooling gel is ideal for tired feet and legs and is ideal to pop in your gym bag, priced £5.15 and now you can buy the good old Rescue Remedy in chewing gum form, priced £4.25. Last but not least is the Pure Rosehip Oil fantastic on eczema, scars, can safely be used in pregnancy to prevent stretchmarks and has a multitude of other uses, priced at £11. For the sweet tooth and chocolate connoisseur in your life then why not pop a couple of bars of Seed and Bean chocolate in their stocking. Seed and Bean have a collection of 18 different flavours, 12 of which are dark chocolate and vegan friendly, the Just Ginger is just delightful. Seed and Bean bars cost £2.49 each and are available online on their website or at Selfridges and Waitrose. I was supplied with some of these products for the purpose of this gift guide but have only used the products I like. There's no job that's relevant for ladies. They are able to do every offbeat job when they take sufficient training. Because it is have been completed in review of edubrdie now, you could do. You can observe the guidlines for a moment continue studying following article.